I’ve recently had to redefine what it means to be on my own in this world, and in doing so decided to take the opportunity to redefine myself in the process. I thought to myself, if I was happy to travel around the world for two years on my own before, what’s to keep me from being happy living in and exploring London independently? I decided it was time to rediscover the true me who was happy to be anywhere in the world even if it was just me, myself, and I. I realized that in order to be truly happy with myself, I needed to focus on things that were important to me and doing things that made me happy, even if it meant doing these things on my own. 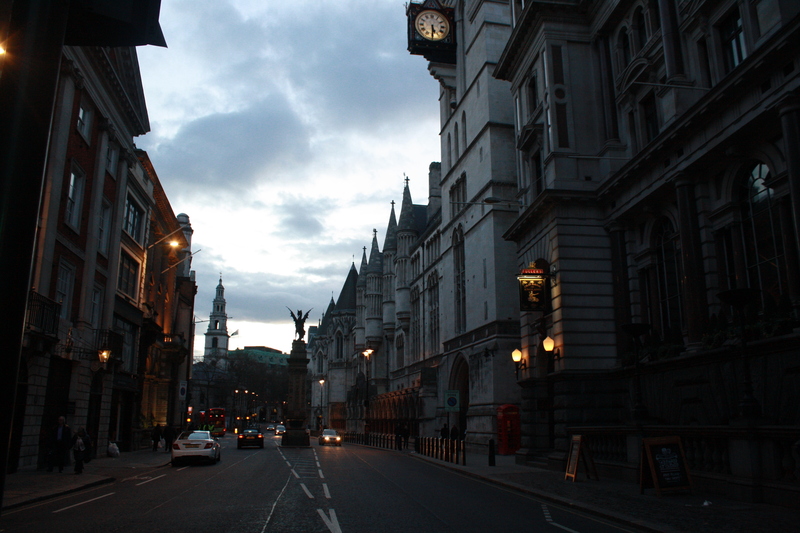 It is these reflections which led to my desire to rediscover London while rediscovering myself. So I did what I rarely ever do–I got lost in a book. In a mad Amazon hunt to find the perfect book that would give me a stronger appreciation for the city I love most, I discovered “London’s Hidden Walks” by Stephen Millar. He now has three volumes and I decided go out of order and start with Volume 2 since reviews indicated that the 12 walks featured in this book were located in and around my London neighborhood, Clerkenwell. 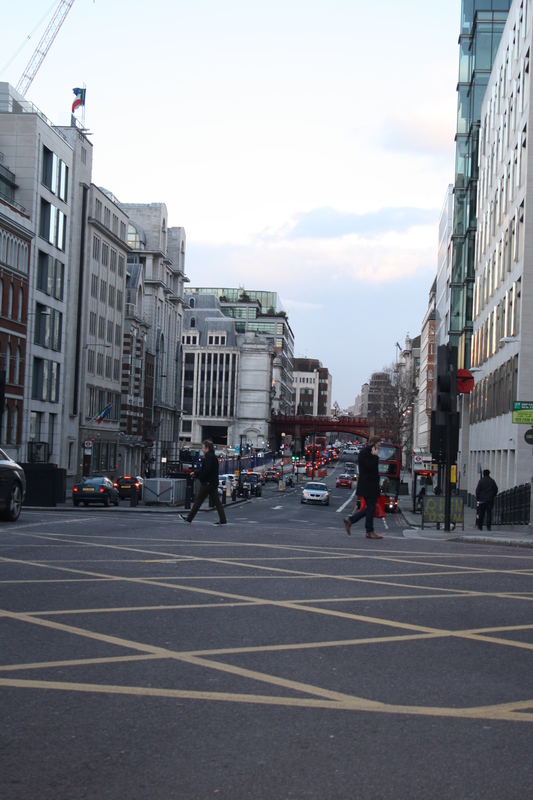 I started out with walk #4: the Strand, Embankment and Fleet Street Walk. As this is a rather big time commitment, I decided to split the walks within this walk up and tackle one area at a time. I’ve just finished the walk from Fleet Street to St. Paul’s Cathedral and what most consider a bustling area for investment banking and law, I now appreciate as a history-heavy filled street which served as the hub for press and publishing in London from the 16th century. Standing in the middle of Fleet Street with the Royal Courts of Justice seen as the pointy white building to the back right and the dragon statue in the center marking the original sight of Temple Bar (see below for photo and info on this gate’s history) and start of Fleet Street. Royal Courts of Justice: The Gothic-styled court building was opened in the late 19th century by Queen Victoria and continues to operate today housing both the Court of Appeal and the High Court. The building is open to the public at certain hours to explore the courts and corridors as well as a hallway lined with displays featuring the history of court attire on the second floor of the Main Hall. If you’re lucky, you may just have the chance to sneak your head into a court in session and see the lawyers dressed in the traditional garbs still worn today. The dragon statue stands at the original site of Temple Bar which served as a gate into the City of London. The gate was originally wooden but was destroyed in the Great Fire of London in 1666 then rebuilt as a stone gate by Sir Christopher Wren. Due to traffic congestion Temple Bar was taken down in 1878 and relocated to a wealthy man’s estate in Hertfordshire, but due to vandalism was once again taken down. In 2004, 125 years later, the gate returned to London and can now be found next to St. Paul’s Cathedral. The dragon, which serves as the City of London’s Coat of Arms, marks the start of Fleet Street. Gruesome Fact: The spikes atop of Temple Bar were originally used to to display the heads of executed prisoners. It was common for street vendors to sell viewing glasses for a penny to those who were looking from further away could get a better view. 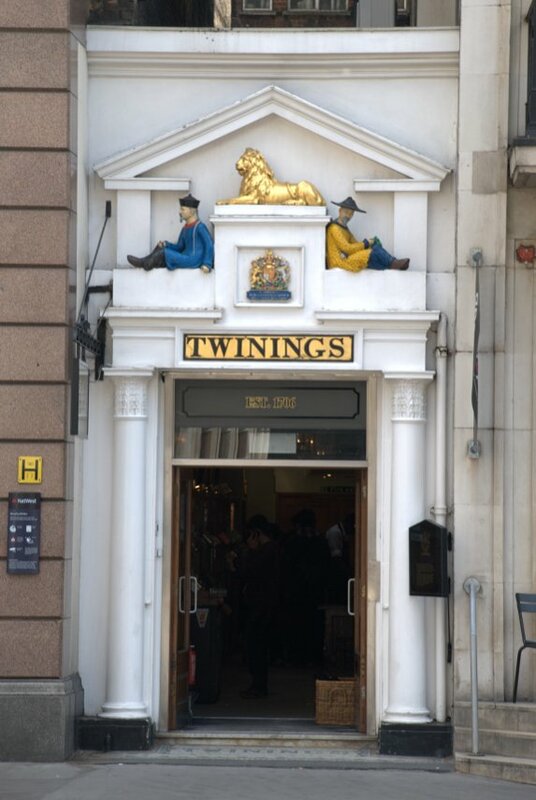 Twinings Tea Shop: The first Twinings Tea Shop to open in 1706. The figures of Chinese tea merchants adorning the top of the tea shop are representative of China’s role as the main supplier of tea to England at that time. St. Dunstan-in-the-West: This medeival church was saved from the Great Fire by the Dean and scholars of Westminster School using buckets of water. 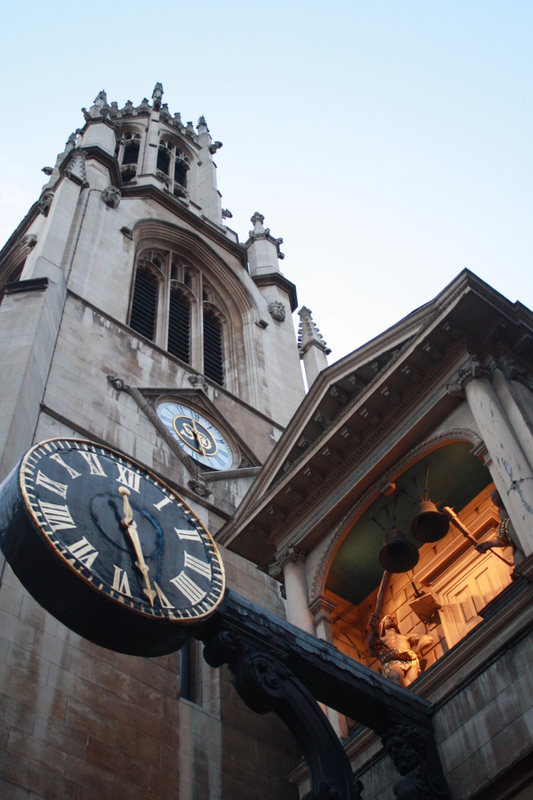 The church’s clock is the first to feature a minute-hand. The two figures above the clock, known as Gog and Magog, are traditionally known as the guardians of the city and would strike the bells every hour and quarter hour. 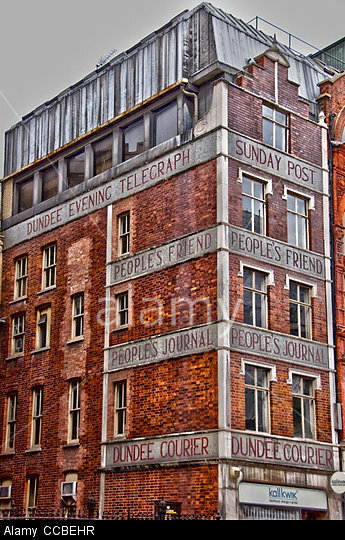 The Red-Brick Building: The only traditional publisher left on Fleet Street. 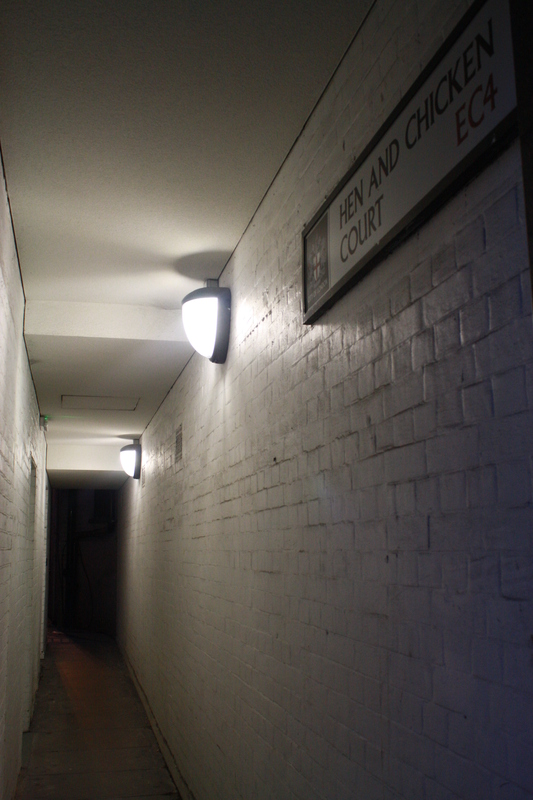 Hen and Chicken Court: The creepy and narrow alleyway leading to the fictitious location of the barber shop belonging to the character, Sweeney Todd. Fleet River: Believe it or not, water used to flow through here. Imagine those two people who today cross the street having to cross over Fleet Bridge to reach the other side. What remains of Fleet River is now covered by New Bridge Street and Farringdon Street and the hidden river flows into the Thames just down the road below Blackfriars Bridge. 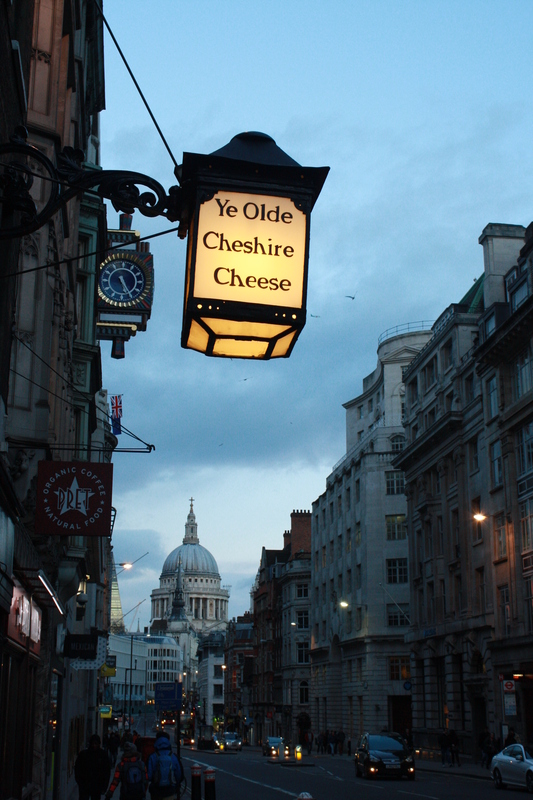 Ye Olde Chesire Cheese: One of the most famous taverns in London dating back to the 17th century. The tavern was frequented by Charles Dickens, Mark Twain and US president Theodore Roosevelt among other intellectuals and writers. So there ya have it folks, my first of many lonely walks around London. This is not meant to be thought of as a depressing reality, but rather enlightening. I am OK with being alone. Because it is when I am alone that I get to feel a part of history that is so often left undiscovered. In that instance, I am surrounded by a reality unknown to others walking past me. And I am happy being with me in a world filled with endless possibilities. Enjoyed reading these insights on walking & solitude…it’s one of my favorite things to do to gain deeper appreciation for a neighborhood. Saving this to my list of to-dos whenever I come to London. 🙂 Thank you for sharing. Much love, my dear! Thanks for the ideas. I’m about to head out on a journey with a friend to London, but now find I’ll be on my own most of the time….Perfect ideas on a walkabout to discover being alone can be down right enjoyable!